Way back in the days of the SWC (SouthWestern Conference) the Houston Cougars were continually struggling for attention under the heels of the traditional powerhouses of the conference. While peppering occasional league titles and bowl appearances, the team went some 10 years without a top 25 finish from the late 70s through the mid-late 80s. It’d be with the arrival of Jack Pardee that the team experienced a renaissance, and return to the national stage. Andre Ware stepped up at quarterback to command Pardee’s Run ‘N Shoot offense in 1989. Despite being under pressure from NCAA sanctions limiting scholarships, and a bowl and TV ban, the Coogs posted a 9-2 record. 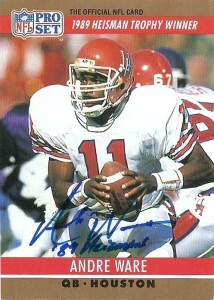 Ware lit the offensive record books on fire, including a 95-21 drubbing of SMU, where Andre threw 6 TDs in one quarter. Andre went on to set 13 NCAA records, including most yards passing in a season (4,699), while his 46 TD passes fell one short of Jim McMahon‘s record. 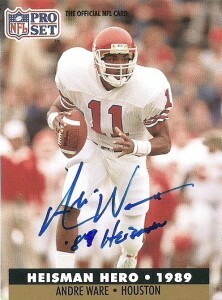 Ware won the Heisman in 1989 after the season during 4th closest vote- ahead of RB Anthony Thompson (Indiana), QB Major Harris (West Virginia), and QB Tony Rice (Notre Dame). Initially Ware intended to stay for his Senior season at UH, but with Jack Pardee bolting for the Houston Oilers down the street- Andre changed his mind and declared for the 1990 NFL draft. The Lions ran the ‘Silver Stretch’ Run ‘N Shoot variant under head coach Wayne Fontes, and offensive coordinator Mouse Davis. At quarterback the team had Rodney Peete, and Bob Gagliano, but the Lions were truly built to run with Barry Sanders in the backfield. Ware only started 1 game over the next two seasons rarely getting a chance behind Peete and later Erik Kramer. He was rumored to have alienated players and coaches with his attitude, but Ware, just wanted to play. The Oilers in the meantime attempted to trade Cody Carlson on two occasions to the Lions for Ware, but failed. After the 1994 season, Andre began the journeyman phase of his career. Over the next few years, Ware saw offseason stops with the Vikings, Raiders, and expansion Jaguars, before finally landing in the CFL with the Ottawa Rough Riders in 1995. 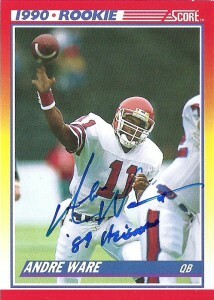 Later he signed with the BC Lions in 1996, and then found himself backing up Doug Flutie on the Grey Cup Championship winning Toronto Argos in 1997. Andre last played football in 1999 for the Berlin Thunder in the NFLE, finally retiring after the season due to a fractured shoulder. Andre has kept to his hometown area, working in the Houston media. He was inducted into the College Football Hall of Fame in 2004, and the Texas Sports Hall of Fame in 2012. He currently works for the Houston Texans as a radio color analyst. 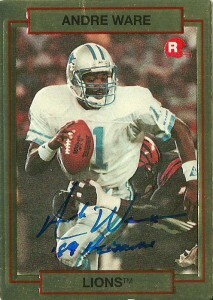 Ware marks another in a long line of players that I really wanted on their cards. With an abundance of amazing shots, it is easy to notice that many of the companies had Andre tabbed as one of the next big superstars and did not want to have their set left in the cold. I had previously attempted to get Andre through my Houston Texans connection, but that obviously failed when he was cut. It took me some time but with some responses popping up occasionally through sports collectors, I jumped at the opportunity to sign the former Cougars’ signal caller. I really couldn’t decide which cards to send to him. His ProSet 1990 Lions card, and Andre’s Score 1990 Supplemental card also deserved some mention along with these 4. Even his Pacific entry had a nice, dynamic look to it. Feeling guilty about sending these four cards, I sent a check for the autographs, but Andre voided the check, and signed and inscribed all of them, in a bit under 100 days.